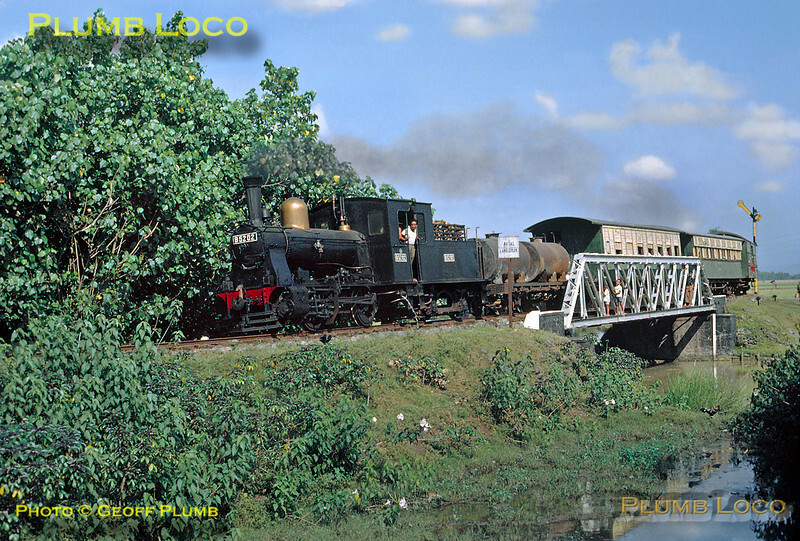 On another tour organized by David Thornhill of "World Steam", I was able to visit Java, Malaysia and Singapore in 1973, when there were some incredibly ancient steam locomotives still in use as well as more modern traction. As with many places, the history of Indonesian Railways is pretty complicated, suffice to say that at the time of my visit the railways were run by PNKA (Perusahaan Negara Kereta Api), Indonesian State Railways, and the lines were 3' 6" gauge. There were also a couple of 2 foot gauge lines and many narrow gauge lines around the sugar mills. Here are a few photos for starters - more will be added as time permits. 0-4-0 tender engines were not exactly commonplace at any time, but in the 1970s such beasts were rarer than hens' teeth! PNKA B52 02 is at the head of the 07:18 train from Kudus to Rembang, seen here soon after leaving Djuana at 08:49 on Monday 23rd July 1973. This train was actually booked to be worked by a diesel between Semerang and Rembang, but in practice the diesel came off at Kudus to work back to Semerang and its place taken by the B52. This then had to be worked pretty hard to keep to the schedule! Slide No. 11659. It nice blog,....thanks for share your collection. great job. I think your one of the proof the existence of Indonesian Railway especially for Steam Loco.